When archaeologists come upon discoveries hidden in the earth, it often takes time to research and make comparative studies in order to truly comprehend them. At first glance, for example, they can identify a piece of pottery, but it may take months or even years of further research to fully appreciate its significance. The same holds true for the Kish Church Project near Shaki in Northwestern Azerbaijan, a project that was undertaken so that the architecture could be restored. In the meantime, the archaeological knowledge gained is helping fill in some of the blanks related to the development and spread of Christianity via Albanian Caucasian churches. 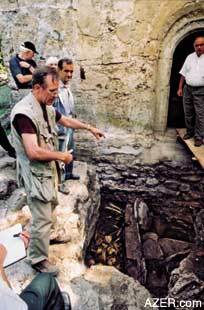 The archaeological dig at the Kish church took place in the summer of 2000. In August, the results of carbon-14 dating on four samples were made available. Now, nearly three years later, scientists have had a chance to do some comparative studies. The results are somewhat different than expected. The church building, as it turns out, was built more recently than previously thought. Instead of being erected in the 5th or 6th century, Carbon-14 dating places it very likely in the 12th century (990-1160 A.D). In addition, the church building itself was discovered to have undergone architectural alterations that reflect theological shifts, brought about by the geopolitical realities of the day. For example, the belief in the nature of Christ (whether he was fully man and / or fully God) is reflected in the height of the floor of the area in the church (the chancel) where the priest officiates in relationship to where the congregation stands. Also the archaeological dig at Kish revealed evidence of the Early Bronze Age culture known as the Kur-Araz culture, which originated in the Caucasus region about 3500 B.C. This culture is known to have spread both northward as well as southward across Anatolia as far as Syria, Israel and Palestine, and possibly even to Egypt. But more significantly, the site on which the church was built suggests that prior to Christianity, it was a cult site that dates back 5,000 years (3,000 years prior to the beginning of Christianity). The fact that this site was used for earlier belief systems is not an unusual phenomenon for sacred sites throughout the world. We've written about the Kish project before when we interviewed archaeologist Bjørnar Storfjell in the summer of 2000 and featured him in an article in our winter issue that year, "The Kish Church, Digging Up History." Search at AZER.com. Now that the results are back from carbon dating, new interpretations can be made. Actually, you have to go quite a distance out of your way even to find the place. From Baku, Azerbaijan's capital, on the western seacoast of the Caspian, you drive about five hours northwest to the charming, picturesque city of Shaki, located in the foothills of the Caucasus Mountains. From there, the Kish village is about five km further north on a poorly marked road with broken pavement. It takes some maneuvering to manage all the ruts. The small village is located about 1,200 meters (3,600 feet) above sea level on a small ridge between two branches of the Kishchay (Kish River). In general, the village is rather non-descript, with its houses constructed of gray river stones. The dull color, however, beguiles the nature of the people who are really quite hospitable and cheerful. Similar to many small mountain villages, agriculture and animal husbandry comprise the backbone of the local economy, but many of the villagers try to supplement their income with work in Shaki. In the summer of 2000, the only obvious employment in the village was the construction of a new mosque. The Kish church sits on a relatively large plot of land, especially given its own small physical size. In fact, the building is actually taller than it is wide. No homes are built close by. The church itself is really small and spartan in both its architectural design and detail. In North Syria, there are more than a hundred churches that bear close resemblance to this one in Kish that were constructed between the 4th and 7th centuries and that are found in the smallest of hamlets and villages. You probably can't fit more than 25-50 people inside them - and that's with everybody standing, as was the custom of the day. Churches didn't have seats or pews back then. In Azerbaijan, there are a number of Christian churches much larger and much older than this one in Kish. The idea for the Kish Project originated with Bjørn Wegge of Norwegian Humanitarian Enterprise of Oslo, who himself had done graduate work in Early Church History in the Eastern Church. His cultural interests coincided with those of Olav Berstad, who was the Norwegian Ambassador to Baku at the time. Berstad himself had been professionally trained as an archaeologist. Between the two of them, the concept for the project soon took on a life of its own. Berstad felt that the more the newly independent nation of Azerbaijan could establish direct links with its past, the more Azerbaijan would be able to strengthen its national identity as a separate entity in the Caucasus. Below: Left and Right: Storfjell consulting at excavations at the Kish Church. The idea was to restore the Kish church architecturally and convert it into a museum, which would then be dedicated to the early church history of Caucasus Albania - the region that now is known as Azerbaijan. The project developed into a joint Azerbaijani-Norwegian effort under the direction of Dr. Gulchohra Mammadova, Rector of the University for Architecture and Construction and a Member of Parliament. However, before reconstruction was to begin, archaeologists were consulted to try to establish the date of the church and determine if there had been any early stages of construction or use. 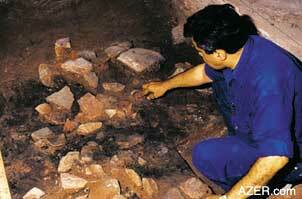 Dr. Vilayat Karimov of Baku's Institute of Archaeology and Ethnography served as the Director of Excavations. Archaeologists included Aliya Garahmadova of the same institute, Suseela C. Y. Storfjell of the University of Sheffield, England. 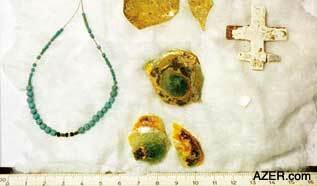 I served as archaeological advisor for the project. The actual archaeological dig was carried out in two sessions: June 5 - July 3, 2000, and then two months later from September 4-13. Archaeological excavation was concentrated mostly inside the church, although a few trenches were dug outside along the north and east side of the apse (the rounded end of the church) [see sketch]. Other trenches were opened in front of the church entrance on the west end and along the south and southwest sides. Inside the church, we began our investigation along the north wall just in front of the chancel steps (the raised platform area where the priests officiate). We soon discovered, however, that we were not the first to carry out some excavation there. After digging down about 1.5 meters, we were surprised to come upon an artifact of quite modern origin - namely, a size D battery manufactured in Japan. It was clear evidence of a spent flashlight of recent date, and the unmistakable traces of treasure hunters - either robbers or bootleg archaeologists! We asked the villagers if they knew of anyone who might have been digging around in the church, but no one seemed to have any knowledge of it. Nor did anyone at Baku's Institute of Archaeology and Ethnography, the institution responsible for coordinating all archaeological activity throughout the country. Of course, on sunny days, the diggers would not have needed any artificial light to dig inside the church. However since they were tunneling under the chancel floor, they obviously needed light to see what they were doing, as the trench was about four meters long (12 feet), much of it under the flooring. They had dug to a considerable depth below the foundation of the church, well into what archaeologists term "sterile soil," meaning soil that has not been modified from its original state. Then the culprits had refilled the trench. However, when it comes to archaeological investigation, such cover-up work can easily be detected, even if the soil has been packed down very hard, which it hadn't been. During the weeks that followed, our imaginations worked overtime trying to think who might have intruded. Soon our speculations became a source of tales and jokes that lightened the grind of everyday excavation work. In the end, we never did learn who had been digging there. Oh, if only walls had eyes to see and tongues to speak! We were quite eager to begin excavation in the northern half of the apse. To do so meant that the altar would have to be dismantled. But then a Georgian priest appeared on the scene, wanting to perform a liturgy. After all, he was just carrying on the intended use for the church, despite the fact that there were no parishioners. He only came once while we were working there. We explained to him what the duration of the project would be, both in regard to excavation, as well as to its architectural restoration. If he had been in the habit of stopping by more frequently at the church, we were not aware of it. He seemed pleased to learn about the restoration work. And so the priest conducted a brief liturgical service while we stood there in silent reverence of that sacred moment in time. The darkness inside the church was accentuated only by a few rays of sun penetrating through the slits in the cupola. There in the darkness, the clergy's face was illuminated by candle flame. His voice echoed through the stone vaulted interior of the old stone structure. It didn't seem to matter that his words were unintelligible to us; they still had the power to transport us back to a different era in time. Soon afterward, we got back to work, excavating the altar to see what might lie beneath it. Archaeology requires that whenever any monument is dismantled that it should first be carefully recorded and photographed as it originally stands. In this case, the plaster was carefully removed so that the stones could be numbered, a process that would facilitate its reassembly. Generally, archaeologists can expect to find a reliquary (a box with a relic that relates closely to the person or the saint) buried underneath the church altar, especially if the place of worship has been named or dedicated after an individual or a saint. We found no such evidence at Kish. Instead, beneath the altar lay irrefutable evidence of an Early Bronze cultic sacrificial pit, yielding secrets of ceramic fragments, charcoal, charred bones and two skulls of sheep or goats. The carbon dating eventually yielded up the secrets of the pit, dating the contents to around 3000 B.C. Our first clues that something was buried under the altar came when we realized that the soil in the pit had a different color and texture. Near the bottom of the pit, we came across some ceramic fragments buried in the dark, ash-like soil. After the ceramic fragments had been cleaned and reassembled, we identified it as a small jar that belonged to what archaeologists call the Kur-Araz culture [Kura-Araxes in Russian]. It was handmade, not turned on a potter's wheel. Its base was smaller than the opening of the jar. This term Kur-Araz in archaeology designates the culture in the watershed region of these two rivers in the Caucasus that dates back to the 4th and 3rd millennia B.C. In the Eastern Mediterranean world, these same ceramic forms that originated in the Caucasus and showed up later in the 3rd millennium B.C. are known as Khirbet Kerak Ware, having been named after the archaeological site on the southwestern shore of the Sea of Galilee in Israel, where they were first discovered in the 1960s. Such ancient pottery found in countries quite distant from the Caucasus such as Syria, Lebanon, Israel and (Amiran 1969: 68-69) is recognized as a foreign cultural phenomenon, with no local roots. Much more research is needed to trace the stages of this cultural migration of ceramic forms from the Caucasus southward into Iran and southwesterly through Anatolia and along the Eastern Mediterranean coastline. This same Kur-Araz culture also migrated north of the Caucasus and was found in the Guba (Kuba via the Russian language) region and also in Dagestan of Southern Russia (Kushnareva 1997:44). It appears that in the Early Bronze period, in the 4th and 3rd millennia B.C., the Caucasus (Trans-Caucasus via Russian) was the cradle of a culture that spread in all directions. More research is needed to understand the development of this cultural diffusion. We also found other artifacts. 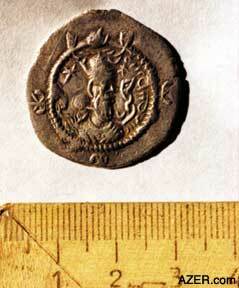 For example, a silver coin was found near the northeast corner of the apse. Unfortunately, it was not recorded and photographed in situ, that is, in the very spot where it had been found. Since it had been removed from its immediate stratigraphic context before being recorded, the coin provided less archaeological value than might have been possible otherwise. The coin was quite legible, both on the obverse, as well as the reverse, side. 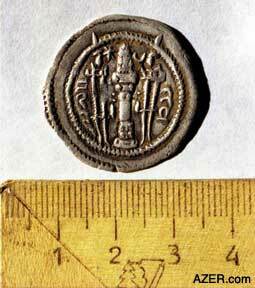 We sent a photo to Dr. Vesta Sarkhosh Curtis, Curator of Parthian and Sasanian Coins at the British Museum, who confirmed that the coin was a silver drachma featuring Sasanian King Kavad I, who ruled from 488-496 A.D. and again from 498-531 A.D. She figured out that the coin belonged to the second period of Kavad's rule because the regnal year on the left side of the reverse reads 39. The mint legend on the right side of the Zoroastrian fire altar is Istakhr, a town about 5 km north of Persepolis in southwest Iran. The Pahlavi/Middle Persian legend on the obverse reads "Kavad Apzud", literally "Kavad Increase," or meaning "May the Glory of Kavad Increase." If it could be ascertained that the coin had come from the construction phase of the church, it still would only have provided us with the earliest possible date for construction. In reality, coins and their mint dates are not the best indicators of the age of the soil layer in which they were found. In a study that I carried out with James Brower in the early 1980s, we showed that coins are reliable for dating only about 40 per cent of the time (Storfjell and Brower 1982). That means you would have a greater chance of being correct by simply flipping the coin. At least then you would have a 50-50 chance of being right! It is, however, fairly safe to conclude that someone had been in the Kish area perhaps in the sixth century or early seventh century and had simply lost the coin. Again it must be stressed that the very limited scope of our excavations leaves us with so many unanswered questions as to who that person might have been and what kind of activities might have been carried out in Kish at that time. In all, we organized four specimens to be tested for Carbon-14 analysis at the Beta Analytic in Miami, Florida that August 2000. One sample was taken from the charcoal found in the pit. Since the charcoal came from the ash-like soil that was found among the charred bones and the broken ceramic jars, we assumed it might provide a likely date that would identify the period of the cult sacrifice and the pottery. When collecting samples for carbon dating, it is necessary to use extreme caution since false readings can occur in the process if the specimens are contaminated. For example, since this form of testing is based on the decay of carbon radioactivity, samples cannot be wrapped in any type of organic material, such as plastic, which is an oil derivative, meaning that as it was made of a petroleum product it contains radiocarbon itself. So we wrapped the four samples that we wanted to test - bone, charcoal and two soil samples - in a mineral derivative-aluminum foil - and placed them in bottles that had caps separating the plastic with tinfoil. We organized for the samples to be taken from the site early one morning when we began excavation. People had been told the day before that we would be gathering the samples, since no one would even be permitted to smoke when we extracted them. Nor did we touch the samples with our hands, but rather coaxed them into the containers using the metal tip of the trowels. The radiocarbon analysis on the charcoal in the pit beneath the altar was 4500±40B.P. (Beta-157479) with a 13C to 12C ratio of -23.7. The 2s calibrated result representing historical dates was 3360 to 3030 B.C. with a 95% probability. This analysis thus corroborates the ceramic analysis that we would make, lending strong support for the pit dating back to the Early Bronze Age (circa 3000 B.C.). This meant that already three millennia before Christianity was founded, the site upon which the Kish church would be built, was being used for sacrifices - as a cult site. Actually, it is quite a common phenomenon that cult sites, where sacred rituals previously were carried out, often retain their sacredness, even though religious form and content may change through the ages. Thus, many churches throughout the world, not just the Kish Church, have been built on the remains of earlier sacred sites. Because of the limited scope of our excavation at Kish, we unfortunately have no further archaeological evidence to understand what might have been going on there during that era. This intriguing question awaits further archaeological work in the village. We also suspected that excavating the chancel area might give us a clearer picture of the various phases that the church might have been used for over the centuries. This turned out to be the case: alteration of the level of the flooring, indeed, was evident and indicated a modification in theological belief. In the nave, we discovered that the church represented two different periods of use, with two different corresponding floor levels. From the apse we know that when the church was first built, the floor in the chancel was only between 30 and 40 cm above the level of the floor of the nave. Later it would be raised to about one meter (100 cm) above the floor of the nave. What is of interest is the presence of two significantly different levels for the floor in the chancel. In the Eastern Church, the theological debate concerning the nature of Christ raged on between the 4th and 5th centuries and was not officially put to rest until the Council of Chalcedon in 451 A.D. Later various national churches aligned themselves with one position or the other. The question that concerned them dealt with the nature of Christ - his deity and his humanity: Was Christ only divine, but manifest in human form, or was He fully divine and fully human at the same time? In church history, this debate came to be known as the monophysite vs. diophysite struggle (one nature vs. two natures). In churches that reflect a belief in Christ as being diophysite - the floor level between the chancel where the priest officiates and where the worshippers stand is closer. In other words, the priest, who is Christ's representative on earth, is in closer proximity to the worshippers. This idea reflects the belief that Christ was God but also fully human. In contrast, in churches holding onto the monophysite belief, the chancel is built at a higher elevation. 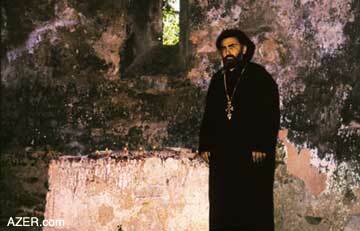 In the Caucasus, three national churches arose during this period, and in the debate related to the nature of Christ, only the Georgian Church followed Constantinople [Istanbul] and the Council of Chalcedon, which settled the Christological debate by pronouncing in favor of the dual nature of Christ - the diophysite position (Ferguson 1997:233). There seems to be some evidence that the Caucasus Albanian Church also remained within the diophysite tradition but only until early in the eighth century (Alexidze 2002:27). After that time, the monophysite doctrine prevailed in both the Armenian Church and the Caucasus Albanian Church (Lerner 1999: 212 and Di Berardino 1992:18). Since the architecture of the apse of the original church in Kish suggests a diophysite Christology, and since the Georgian Church was the only diophysite church existing in the Caucasus in the late medieval period, it seems reasonable to suggest that the Kish church was built as a Georgian church and was later taken over by monophysites. The remaining three radiocarbon dates also seem to favor such an interpretation. We chose the second sample for carbon dating from some charcoal taken from the lowest soil layer in the nave. Since there was only sterile soil below this sample, it would represent the time period of the construction of the original church, when the area would have been cleared for that purpose. The result of the analysis of the sample was 980±40B.P. (Beta-157480) and the 13C to 12C ratio was - 25.3. The 2s calibrated result representing historical dates was 990 to 1160 A.D. with a 95% probability. The other two samples were bone fragments from two burials that relate to the construction of the church. Outside the church on the eastern side of the building, we found a series of burials. Curiously, the lowest burial in this sequence had caused the builders of the church to make a small niche at the very bottom of the foundation wall for the apse, no more than about 20 cm. deep, to accommodate the skull of the burial. In digging the trench for the foundation, the builders had come upon this burial, and not wanting to disturb it, had made a small indentation in the base of the foundation so the head in the burial would not be disturbed. The burial orientation with the head to the west and the feet to the east, leads us to assume that the burial was Christian. Its relationship to the foundation wall suggests that it was already there when the church was built. The result of this sample was 1000±40B.P. (Beta-157482) and the 13C to 12C ratio was -19.1. The 2s calibrated results representing historical dates were A.D. 980 to 1060 and A.D. 1080 to 1150 with a 95% probability. In this situation the first set of dates, A.D. 980 to 1060, represent the better curve, since the 1sigma limits fall within those dates, while the second set represents a "shadow." Thus the first set of dates is the one preferred. That would seem to suggest that the burial could have been nearly a century earlier than when the church was built, possibly early in the 12th century. Again, historically this fits very well. It was during the expansion of Georgia under the rule of King David the Builder (1089-1125 A.D.), when nearly all of the territory from the Caspian Sea to the Black Sea was under Georgian influence (Alexidze, October 11, 2001 and Allen 1971:96-100). Thus, the architectural elements that reflect theology point to a Georgian church. Chronologically, the radiocarbon dates do the same. Dr. Zaza Alexidze of the Kekelidze Institute of Manuscripts of the Georgian Academy of Sciences in Tbilisi, Georgia informs us that the general area of Kish remained under Georgian suzerainty until the 17th century, when the Persian Shah Abbas wrestled it from Georgia and established the "Sultanate of Elis" (Alexidze, October 11, 2001). It is probably quite safe to assume that it was the diophysite theology of the Georgian Church that was followed and reflected in the architecture in Kish, since the area was under Georgian political control. It would probably also be safe to assume that as soon as Georgia no longer controlled the region, the Caucasus Albanian Church, which since the eighth century, and possibly earlier, had adopted a monophysite theology like the Armenian Church, would make its theological position felt in regards to the height of the chancel in the church. We can then conclude that the remodeling of the church, elevating the chancel from between 30 to 40 cm above the floor in the nave to nearly 1 meter above the floor, took place sometime in the 17th century. Also, after the small enlargement of the chancel area, the church remained a monophysite place of worship until it ceased to be an active church in the 19th century. Perhaps, this even explains the tradition of the visit by the Georgian priest to conduct services despite the fact that he had no parishioners. Therefore, the medieval literary tradition concerning the church in Kish (and earlier oral tradition which cannot be verified), repeated by several present-day scholars (Mammadova 2002: 34, 35, 38), cannot be given serious consideration. 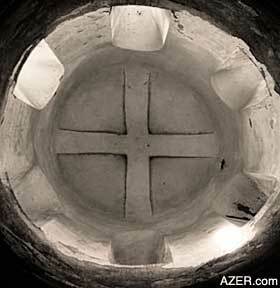 This tradition suggests that the Kish Church was built at the end of the first century A.D. If true, that would indeed make this a truly significant church, since no church structures anywhere in the world are known to have been constructed earlier than the mid- to late-third century (Meyers 1997:1). To refer to the Kish church as the "Church of St. Eliseus" (Mammadova 2002) is to attempt to give scholarly credence to a medieval literary tradition whose date cannot be substantiated and supported by archaeological evidence. 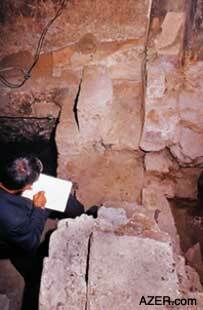 The fourth sample for carbon dating was a bone taken from a tomb under the entrance to the church. The radiocarbon analysis gave a result of 700±40B.P. (Beta-157481) with a 13C to 12C ratio of -18.8 . The 2s calibrated results representing historical dates were 1260 to 1310 A.D. and 1360 to 1390 A.D. with a 95% probability. This situation is the same as the one encountered with Beta-157482 and, therefore, the preferred dates are 1260 A.D. to 1310. A mended glazed ceramic bowl from this tomb also suggests a late medieval date. Other items in the grave clearly were related to some high-ranking clergy in the early years after the construction of the church. These finds consisted of a small cross made of mother-of-pearl and numerous strands of gilded thread, which very likely came from his clerical robes. 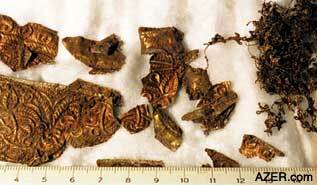 There was also an embossed gold piece, probably part of a belt or sash for clerical attire. Even the shape of the church itself - the cruciform, or cross-in-square appearance, known as quincunx - also suggests a date in the late medieval period. Such designs are common in the Caucasus and may even have originated in the region (Krautheimer 1965:245). 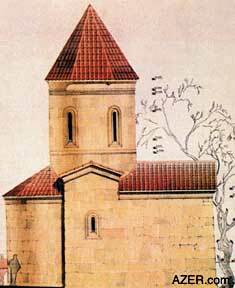 The Kish church only had the appearance of being cross-in-square, while, in truth, it was really a rectangular building with an external semi-circular apse at the east end. On each of the long sides of the building, the architect had placed a small gable, giving the appearance that the church was built in the shape of a cross. At first we thought this was a feature added at the time of a later remodeling or reconstruction phase. It now seems certain to have been the original design. Even with the rather limited scope of this archaeological project related to the Kish church, significant finds and implications for early history, including some of the ecclesiastical history of the region, have come to light. It seems we have just been served an appetizer and can only dream of the kind of archaeological feast that awaits if more extensive excavations can be organized in the village of Kish. That feast will have to come with future projects. Alexidze, Zaza, Tbilisi, Georgia to J. Bjørnar Storfjell, Aylesbury, England, October 11, 2001. Personal communication. ___ "Voices of the Ancients: Rare Caucasus Albanian Text." 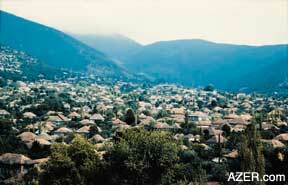 Azerbaijan International 10:2 (Summer 2002): 26-27, Sherman Oaks, CA. Allen, W. E. D. A History of the Georgian People from the Beginning down to the Russian Conquest in the Nineteenth Century. London: Routledge & Kegan Paul, 1932 and 1971. Amiran, Ruth. 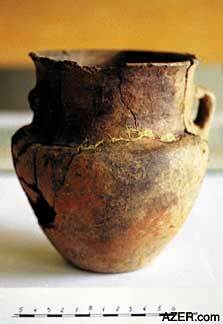 Ancient Pottery of the Holy Land: From its Beginning in the Neolithic Period to the End of the Iron Age. Jerusalem: Massada Press, 1969. Di Berardino, Angelo, ed. Encyclopedia of the Early Church. Translated from the Italian by Adrian Walford. Cambridge: James Clarke & Co., 1992. S.v. "Albania of Caucasus," by M. Falla Castelfranchi. ___, ed. Encyclopedia of the Early Church. Translated from the Italian by Adrian Walford. Cambridge: James Clarke & Co., 1992. S.v. "Georgia," by M. Falla Castelfranchi. Krautheimer, Richard. Early Christian and Byzantine Architecture. Harmondsworth, Middlesex: Penguin Books, 1965. Kushnareva, K. Kh. The Southern Caucasus in Prehistory: Stages of Cultural and Socioeconomic Development from the Eighth to the Second Millennium B.C. Translated by H. N. Michael. University Museum Monograph 99. Philadelphia: The University Museum, University of Pennsylvania, 1997. Lerner, Konstantin. "Georgia, Christian history of." In The Blackwell Dictionary of Eastern Christianity, eds. Ken Parry, et al., 210-214. Oxford: Blackwell Publishers, 1999. Mammadova, Gulchohra (Mamedova). "The Azerbaijan-Norwegian Kish Project: Progress Report." 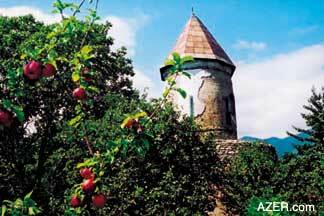 The History of Caucasus: Scientific Public Almanac 2 (June 2002): 33-40. Meyers, Eric M., ed. The Oxford Encyclopedia of Archaeology in the Near East. New York and Oxford: Oxford University Press, 1997. S.v. "Churches," by Paul Corby Finney. Ferguson, Everett, Michael P. McHugh, and Frederick W. Norris, eds. Encyclopedia of Early Christianity. Second edition. New York and London: Garland Publishing, Inc., 1997. S.v. "Chalcedon, Chalcedonian Creed," by Frederick W. Norris. Sarkhosh Curtis, Vesta, London to J. Bjørnar Storfjell, Tromsø, Norway, July 6, 2000. Personal communication. Storfjell, J. Bjornar. "The Kish Church: Digging Up History. Norwegians Help Restore Ancient Church." Azerbaijan International (AI 8.4), Winter 2000, pp. 18-21, Sherman Oaks, CA. ___, and James K. Brower. "The Use of Coins for Findspot Dating." Paper Presented at Annual Meeting of the American Schools of Oriental Research, New York, New York. December 20, 1982. J. Bjørnar Storfjell, Ph.D., formerly professor of archaeology at Andrews University in Michigan (1980-1999) and head archaeologist in the summers of 2001 and 2002 of Thor Heyerdahl's final project to see if there were any links between Scandanavia and Azov, Russia.